Where are your old photos? Are they stored under a bed or high up in a closet? Maybe they’re even in the attic or the basement where heat and humidity are adversely affecting the very paper on which your memories are stored. In any event, it’s time to get them out of storage and up on the wall. I know what you’re thinking: it’s too expensive, or there are just too many to sort through. Don’t panic—you can do this, and I’m going to help. For starters, take it slowly. Just start going through the pile of photos and sort out only your favorites. Then set those aside and put the others away (preferably not in the basement or attic). Now it’s time to narrow your favorites down to the four you like most. Later you can work up to growing your collection. Before you get busy with a hammer, lay out the framed photos on the floor. Arrange and rearrange them in a way that looks appealing to you. 1 . Aim for a shape—triangle, square or rectangle. 2. Keep the space between each frame even. 3. Line them all up on either the left or the right. Once you have a design that is pleasing to you, it’s time to start hanging. Entryways, stairways and family rooms are all great places to display photos. Embrace the fact that you are also preserving precious memories. Prince William resident Vickie Williamson has been working in the fine art, framing and decorating industry for more than 25 years and has a Bachelor of Fine Arts degree from Valdosta State University. Vickie is the in-house designer at Broadway Gallery. When it comes time for you to add a piece of art to your collection, there are a variety of options to consider. Art falls into two categories: originals and reproductions. Originals can include an assortment of mediums, such as etchings, oil on canvas, oil on paper, pastels, and more. Reproductions also have variances, as they can be numbered, and signed or left unsigned by the artist. We have plethora of great art, all in varying mediums and price ranges. You can check them out by clicking here. Take a look at this Southwest art poster we framed! This Manus Island Tree Snail by Henry Domke looks bright and fun! We framed and hung an asian watercolor triptych for one of our customers! If you fall in love with a piece of art at a flea market or garage sale grab it. There are loads of ways to make an inexpensive piece look expensive and fit perfectly into your décor. I was recently at Salvation Army and found a beautiful flower painting. The frame and matting was in pretty bad shape but it was only $5! There is nothing wrong with grabbing a bargain on something you like. I brought it back to the gallery and picked out a small mat and new frame – ta da! I have a perfect piece at a steal of a deal. What a fantastic entryway, how does yours look? We want to help you with your project no matter its size. Bring us a drawing of your child did or a ticket stub from your 10th wedding anniversary. Whatever it is big or small we have the resources and knowledge to help. Be honest with us, come in and tell us your budget and we’ll make it work. That’s why we’re framing professionals. Don’t forget to check out what we call our smaller “Ready-made Frames.” We make them using scraps from larger projects and they are beautiful. If you have more creative ideas for framing or art on a budget, share them with us! Do you have some old photos of you and your family members hiding in a shoebox under your bed? Or maybe your folks have them stashed away in some moving boxes or albums in the attic. Wherever they may be kept, memories of your family are precious, so why not pull them out and showcase them in your home? Better yet, why not let our framing experts at Broadway Galleries help you showcase your family photos on a wall with a vignette, or place them in your home where they can be seen, remembered and treasured, never forgotten. In everybody’s home there should be a place to honor your family. Whether you have photos from the past or present, it is a nice idea to dust off your photo albums and bring your photos into our gallery. 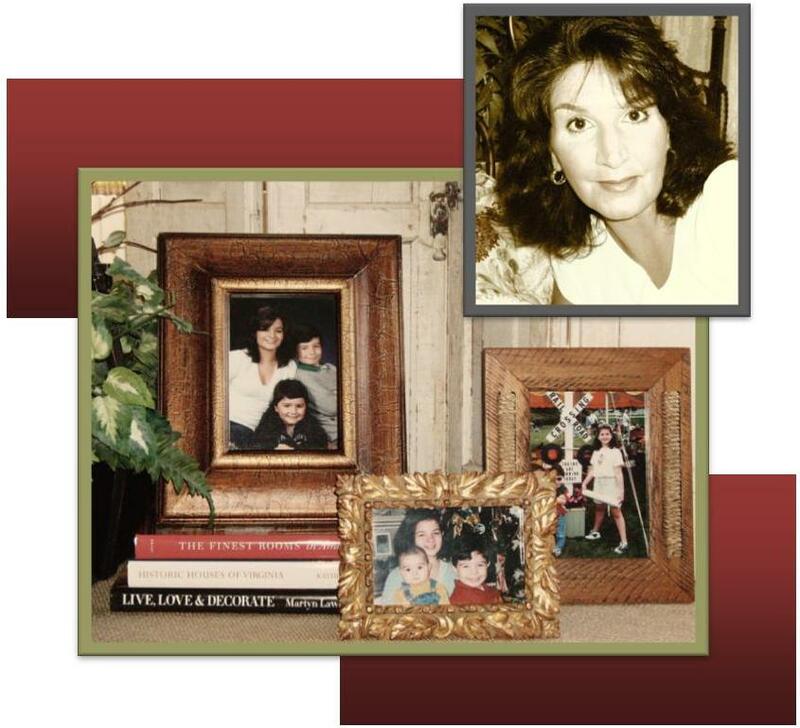 We are more than happy to discuss the options available, such as restoring antique photos, creating customized frames, or designing a painting of family portraits. We also have experience in enlarging memorable photos – who doesn’t want to see Grandma’s face as big as it was in real life? We’ll even come into your home to help figure out if they would look best hung in a family room, the kids’ play room, or above a frequently used staircase. Finding the appropriate location in your home to showcase your photos is important, and is often-overlooked. Our team has vast knowledge of all different types of framing that can help accentuate all different styles of photography, whether informal or elaborate. The best way to remember fond memories of family and friends is to keep them around you, and we are here to help you do it the right way! Check out some of the neat family photos we have done below. Framed restored photo! How sweet. 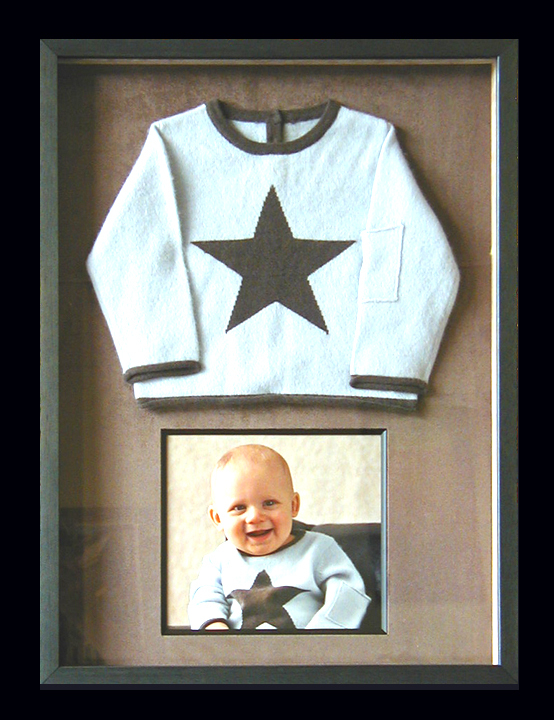 Baby photo and favorite baby sweater make a great gift! Looking at 3rd generation and further! Broadway Galleries did a great job a grouping photos for a customer as seen above! First impressions mean a lot, don’t they? When you walk into an office as an employee or client I know you judge the company based upon what it looks like… don’t you? Check out these wall installations Broadway Galleries did for AOL! Picture this with me: you walk into work one morning and the lights are dim, the walls are that stark hospital white and there is only a metal stool to sit on. Not too inviting is it? Now imagine you walk into the office and the walls are a light shade of yellow, there is attractive and inviting art on the walls and the sun is shining in the windows. Ok – so things can’t always be this perfect but you can easily make a difference in your office environment with a few small changes. We were recently commissioned, by referral, to provide an art consulting service for a corporate office in Reston, VA. We were hired to give advice on art to be displayed in several rooms including conference rooms, executive offices, reception areas, lunch rooms, and more. We worked with the company for a while to understand the exact feeling they wanted in each room, their budget and also the color scheme. It is very important to us that we create exactly what you’re looking for. At the end of the day we can find any artwork to fit a need – we want it to fit you need. Once the artwork was purchased and hung in this office it changed the whole atmosphere of the office to be refreshing and uplifting. The employees were curious to see the new artwork and I believe they were happy to know the company cared enough to properly represent them and create a welcoming work environment. What about a relaxing beach theme in your office? Imagine an office filled with images of people walking on the boardwalk, eating ice cream, and enjoying themselves. Personally, when I see this type of art it reminds me of my days growing up close to the New Jersey shore, and the family vacations we would go on. What is wrong with that? Nothing! You are allowed to enjoy yourself and your environment at work – it doesn’t have to be so bland. What was the last faster food restaurant you went in to? Chipotle, McDonald’s? Have you noticed the art on their walls? They have pictures of McDonald’s in black and white when it first opened. They have creative wood and metal sculptures adorning their walls. Check out the neat art in a Denver Chipotle! These pieces of art were picked out by professional art consultants and create an environment that people want to be in. Shouldn’t your office feel this way? More importantly your company’s brand must be properly represented anywhere it touches a client. Call, email or come in to visit us today. We would like to talk with you about different way to enhance your office environment and brand representation through art on any budget. You might think that art evaluations and art appraisals are one in the same. Alas, you are mistaken – there is a big difference. Let’s learn! An art evaluation is subjective, while an art appraisal is objective. What this means is that, for an evaluation somebody conducts research to determine the significance, worth, or condition of a piece of art. Where should this art be hung or positioned? Does it need to be restored? How is the framing quality? How is the lighting on the art? On the flip side appraising artwork is objective because there is a fixed and finite decision made on an item for legal purposes and insurance reasons. An experienced appraiser will supply the owner with a professional estimate of the value of the piece of property. In many cases, this estimate is necessary before the artwork, jewelry, or home can be insured. We provide both evaluations and appraisals for individuals and companies alike. In the United States, the Appraisal Foundation’s Appraiser Qualifications Board has certain qualifications that must be met in order for someone to give their appraisal. Check out Broadway Galleries Guest Appraiser for the day! At Broadway Galleries, Barry Broadway is well-trained to complete the evaluations and works with a preferred professional for you to get any thing appraised. Currently, Barry was asked to evaluate a local D.C. law firm’s corporate art collection. Barry suggested going in to evaluate the art first and then if the art is in good condition and is a popular-enough piece then the collection should be appraised. The reason for this is that the cost of appraising a collection worth $10,000 or more can be quite an investment. You should get your collection evaluated and/or appraised because it is important to know their value. You might have a hidden treasure! If you have several pieces of art or property that is given to you or belongs to a family member and it is appraised with a high monetary value, then it should be insured. This is important to do before handing down a piece of high-end art, because you can be taxed on the art. We recommend appraisals because they are a legal document and would stand up in court for purchases, sales, and refinancing. They can also be included in property evaluation reports for estate, divorce, foreclosure, insurance, tax appeal, and more. If you have anything you think may have value, or you are unsure about a family heirloom please contact us. We would be happy to help you determine its value and discuss the options available. Is 50% Off Really 50% Off? An interesting topic recently came up with a friend of mine. She had just come back from a trip to Europe with several beautiful pieces of artwork. We were at her house discussing where to hang them and both realized she should get her artwork framed. Not only would a frame protect her art, but would also showcase the beauty of the pictures. The next step was to figure out where to get them framed. I, of course, recommended Broadway Galleries. But she told me flat-out that she thought a gallery would be too expensive, and instead was thinking about trying a larger chain such as Michael’s. Best yet, she had just received a 50% off coupon from them. She figured it had to be a steal of a deal. Let’s chat about this for a minute, because this is a common perspective. Remember to read the fine print of coupons! There are some chain framing stores that usually offer very large discounts or coupons … but how is the quality of the frame or the sales person recommending the frame and matting? How fast is their turnaround process? Will they have a variety of options or help you choose what is best for your budget and style preference? There are so many things to take into account! Once you have something framed you typically intend to keep it that way for years. To help my friend out, I did a bit of research on a few of these big companies with great discounts. I found their prices to be quite comparable to Broadway Galleries. At Broadway Galleries we want to provide quality products, great customer service, and build customer loyalty. And at Broadway Galleries you can guarantee that your sales person and framer are experienced. Chain stores are great for buying arts and crafts and odds and ends, and they did entice my friend with the 50% off coupon they advertised. But what does 50% off mean? 50% off the frame? 50% off the labor? Or 50% off the total cost? Hmm is this really 50% off? Some coupons have specific limits to your purchase listed in fine print. It also is apparent that some chain framing stores raise their prices when a promotional coupon goes out, which means the end result is that many people pay the same amount they would during a non-coupon sales period. Smart marketing! Something else that breeds uncertainty is the question of where the frame is actually made. It could be anywhere. At Broadway Galleries, all of our frames are made in our shop in the United States. Overall framing can be a large investment but it also can be very affordable. It simply depends on what type of materials you want. Hopefully you will frame it once and have that frame last for generations. At Broadway Galleries, just tell us what your budget is and we will make sure to find you the perfect beautiful frame. This is what we do for a living, and we’re good at it. Just remember – 50% off isn’t always 50% off! Call or email us to get a free quote today: 703-354-2905. You will be surprised how we stack up against the competition! Olympic Fever – Framing Style! Did you go to the Olympics and find something wonderful? If not, did you get to watch any of the events and root on your country? If you did and you have an item or memory that is special to you, why not frame it? Did you buy a flag in London? Did you snap any special photographs or come across any great pictures of the Olympic ceremonies? How about a special shirt or some commemorative Olympic memorabilia? The 2012 Olympic Experience in London! Whatever your treasure may be let us help you keep it attractive forever. Remember your visit with a t-shirt or bring one home for a friend! The Olympics is a great example of a special memory, and framing those pictures, jerseys, hats, balls and other tokens is a great way to honor those memories. Perhaps you made some new memories this summer on a tropical vacation, family reunion or a best friend’s wedding. Maybe you found some beautiful seashells or held onto some tickets stubs to a baseball game. No matter what kind of memory you may want to save, Broadway Galleries wants to help you preserve them. Within our framing store we offer quality supplies and help you design the perfect way to preserve those special times in your life. We enjoy being able to help our customers design vignettes for their photos and can even help you pick just the right place in your home that will allow you to hold on to these fun memories in a unique and personal way. When you have a great memory, you don’t want to keep those photos or special keepsakes packed away in a box… you should showcase them! Great jerseys, balls, hats and photos are meant to make you relive a memory or make you have a strong feeling. That feeling could be warm, cold, give you goose bumps, or reminisce about a special moment in time. Let us help you frame your sports memorabilia and treasures to make them last forever!